Love the D-Rays? 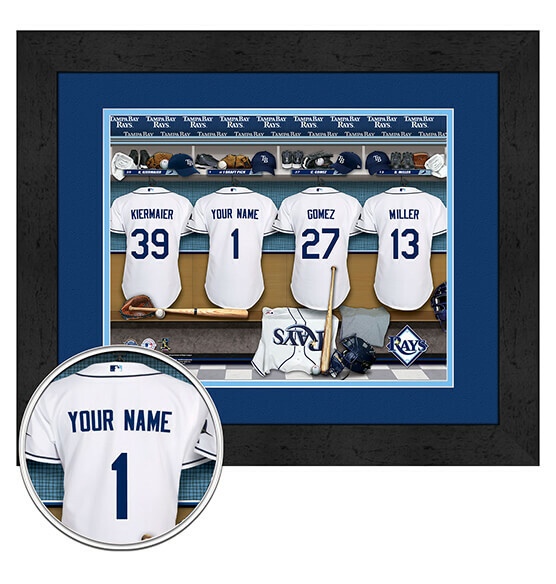 Although it's too late for you to help them with another "greatest comeback" in MLB junior circuit history, you can still be part of this epic locker room team thanks to our Personalized Locker Room Framed Wall Art. Specify what name you want added to the back of one of these four Rays jerseys and we'll do the rest. Featuring a stunning digital double mat in team colors, glass and a striking black frame, you're likely to enter the gift-giving hall of fame when you present this memorable gift to your favorite Tampa Bay Rays fan. Print measures 12" by 16"